Stop by and see Special Collections & Archives’ newest exhibit in the Booth-Bricker Reading Room: Artistic Printing in the Nineteenth Century curated by Loyola printmaking professor Bill Kitchens. 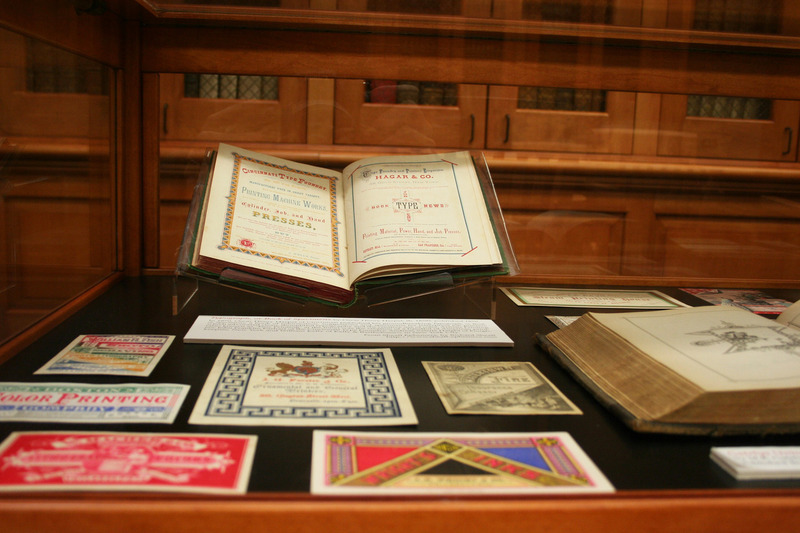 This gorgeous exhibit displays Kitchens’ vast collection 19th century trade show cards and discusses the history of letterpress and lithographic printmaking in early American graphic design. We are thrilled to host this collection of colorful cards, books, and printmaking apparatuses in our Booth-Bricker Reading Room on the 3rd floor of the Monroe Library through the Fall 2018 semester. Come see it for yourself during our open hours: T-Th, 9-12 and 1-4pm. This entry was posted on Thursday, October 11th, 2018 at 10:53 am	and is filed under Exhibits, Found in Archives. You can follow any responses to this entry through the RSS 2.0 feed. You can skip to the end and leave a response. Pinging is currently not allowed.